William Stuntz, who unfortunately died young, before this book was published, was a leading criminal law scholar, and this volume is exceptionally rich, insightful, provocative, and well-written. It is bound to have great influence on academic thinking, and perhaps in time on the criminal justice system itself. (The publisher cannot, however, be forgiven for the seventy-eight pages of endnotes, which are useless to readers unwilling to flip to the back of the book almost three times per page. There are 872 notes and 309 pages of text, an average of 2.82 endnotes per page.) Stuntz’s book will repay much closer scrutiny than I can give it in a review. But it is mistitled. The American criminal justice system is not in a state of collapse, or even in any danger of collapse. Stuntz is wrong when he says, on the first page of his book, that “the last half of the twentieth century saw America’s criminal justice system unravel.” The system is costly in human terms but not in budgetary terms (2.3 million Americans are in custody, most of whom could, in principle, be productively employed). Stuntz’s real complaint is that it is oppressive, and in particular oppressive of blacks. He argues that it imprisons too many Americans, and in particular too many black Americans. The book terms America’s “disproportionately black prison population” the “central criminal justice problem of our time.” The focus is refreshingly odd: not on victims of crime (except when Stuntz is talking about blacks in the South before the civil rights revolution), not on the costs of crime, indeed not on criminals as such. Instead it focuses on the incarcerated, on inmates. Stuntz, again refreshingly, is impossible to pigeonhole politically: he certainly is not tough on crime, but neither is he a civil libertarian—indeed, he is a fierce critic of the liberal criminal-procedure decisions of the Supreme Court when Earl Warren was the chief justice. The problems that Stuntz identifies—too many inmates, and many too many black inmates—are separable; so separable that his book is really two books, one about the criminal justice system, and one about the abnormal crime rate of blacks, which translates into an abnormal percentage of black prison inmates. Solving the first problem (too many inmates) would solve the second (too many black inmates), but solving the second would not solve the first, even though almost 40 percent of prison and jail inmates are black. Blacks are 13 percent of the American population, so that if the black inmate population were reduced to 13 percent of the total inmate population, that population would fall by 27 percent—but it would still be much higher than in the countries that we consider our peers. For the percentage of our population that is incarcerated is the highest of any country in the world; and at a shade under 3 percent (though it has been falling recently because of the states’ fiscal distress), it exceeds by factors of 4 to 7 the percentage incarcerated in any of our peer countries. And yet our crime rates are generally no lower than in those countries, and our murder rate is much higher. Our higher rate of incarceration is attributable primarily to more arrests and convictions rather than to our criminalizing more activities or imposing longer prison sentences, though those are factors as well. TO EXPLAIN OUR abnormal, racially slanted rate of incarceration, Stuntz offers a historical narrative—the book should have been labeled a history of American criminal justice, with particular attention to blacks. He begins the narrative with two large migrations: the flood of Irish, Italian, and Central and Eastern European immigrants to the United States between roughly 1880 and 1920, and the migration of Southern blacks to the North during the first two-thirds of the twentieth century. Both sets of migrants settled mainly in Northern cities, and both migrations caused crime waves, because most of the migrants were young males and because cities provide a favorable environment for gangs. But the crime wave caused by the immigrants abated, while the crime wave caused by the black migrants did not. Stuntz explains the difference by the fact that in Northern cities the immigrants were able to wrest a considerable measure of control over their neighborhoods, whereas blacks had much less success in obtaining control over their neighborhoods. This is a vital difference for Stuntz, because he believes that crime control should be meaningfully local, and if so it will be at once lenient and effective. To demonstrate this, he re-starts the historical narrative with a sketch of crime control in the eighteenth and early nineteenth centuries, and intermingles this narrative with the history of criminal punishment of blacks, and race relations more broadly, in the South since before the Civil War. The narratives are well done, but they do not provide convincing evidence for the “meaningfully local” thesis that is central to the book. The narrative that starts with the eighteenth century is central to Stuntz’s own thinking about the overall problem of excessive incarceration, as distinct from the problem of excessive incarceration of blacks. He is nostalgic for eighteenth-century crime control, and thinks that the Bill of Rights set us on the wrong track. In the eighteenth century, there were no public police (as distinct from, say, citizen nightwatchmen) or public prosecutors; victims of crime might hire a lawyer to prosecute the criminal, but often neither side in a criminal trial was represented by a lawyer; procedure in criminal cases was informal. Most crimes, moreover, were “common law” crimes—that is, acts declared by judges rather than legislators to be crimes—and this, Stuntz notes, reduced the politicization of criminal law. A high percentage of criminal cases was decided by juries, which were empowered to resolve issues of law as well as of fact, and thus to decide cases in accordance with their own local ideas of justice. Jurors were neighbors of the criminal defendants as well as of the crime victims, and their sympathy for victims was thus (Stuntz argues) tempered by sympathy for defendants qua neighbors. Stuntz claims that this unprofessional, informal system of neighborhood justice promoted perceptions of fairness and legitimacy by the citizenry, which in turn promoted voluntary compliance with law; and as a result crime rates were low, even though law enforcement was sporadic and punishments usually quite lenient. The wrong turn that the framers of the Bill of Rights took, he argues, was to codify purely procedural rights (for the most part), such as the right to trial by jury and to be free from unreasonable searches—rights that were already well-established in state practice. Surprisingly for a law professor, Stuntz does not think much of these rights, in part because he thinks they were designed to protect mainly elite political criminals, who naturally engaged the sympathies of the elite former rebels who drafted the Bill of Rights. AT THIS POINT Stuntz’s second narrative, that of the history of American blacks, becomes relevant. The criminal justice system of the Southern states, controlled by whites who strove to keep their large black populations in a servile state long after the Civil War ended, was an outrage—but not because of defects in procedural law. Its offense was owed to discriminatory law enforcement, about which the Supreme Court did nothing until the 1930s and very little until the 1950s and 1960s. In fact, Stuntz sees the Court as having made things worse for blacks, especially in the South before the civil rights revolution. He argues that the proceduralist orientation of the Bill of Rights—which the Supreme Court promoted by imposing on the states, in the name of due process, most of the provisions of the Bill of Rights, originally a set of limitations on just the federal government—harmed Southern blacks, because the proceduralist focus is on the rights of criminal defendants. What Southern blacks mostly needed was protection against criminals: both white, because of vigilante justice, and black, because the law enforcement system was largely indifferent to black-on-black crime. Yet all this has rather little to do with current rates of black crime and incarceration, although one reason that black incarceration rates have risen—a reason Stuntz approves—is that black-on-black crime is now taken seriously. The history of criminal justice outside of the South between the eighteenth century and the 1960s turns out also to be rather to one side of Stuntz’s subject, being relevant mainly to his suggested solution to the problem of an excessive prison population—a return to meaningfully local eighteenth-century-style criminal justice. The main explanation that he tenders for the surge in the inmate population, which did not begin until the 1970s, is the conjunction of soaring crime rates in the 1960s with the liberal decisions of the Supreme Court of that period, the “Warren Court.” He could have started his narrative in 1960, when crime, arrest, prosecution, conviction, and incarceration rates were much lower than they have been at any time since. Had he done so, the book would be less interesting but more focused. Crime rates were very low during World War II (because so many young males were in the armed forces and unemployment was virtually nonexistent) and its immediate aftermath, and as a result the prison population fell. Crime rates remained low until the 1960s, when they took off. The reasons are unclear, but seem related to the disorders of the 1960s and early 1970s, in particular the growth of black militancy, which Stuntz argues caused the police to reduce their presence in black communities, with the result that black-on-black crime surged. At first the crime wave did not generate a significant increase in the inmate population, and Stuntz acknowledges that the lag contributed to the crime wave. But beginning in 1972, and continuing until the economic downturn triggered by the financial crisis of 2008 socked government budgets, the inmate population soared. It had been 118 per 100,000 Americans in 1950. It was actually lower in 1972-1993 per 100,000; but by 2000 it had reached 469. Between 1950 and 2000, the white imprisonment rate increased by 184 percent, and the black imprisonment rate by 355 percent. Even though the overall crime rate fell by one-third in the 1990s (and by two-thirds in many large cities)—the murder rate by more than 40 percent—the inmate population continued growing during this period, an increase that cannot be explained by population growth, since the population grew in the 1990s by much less than one-third. The backlash took the potent form of combining higher maximum sentences (as by abolition of parole), especially for federal crimes, for which sentences were already typically higher than the sentences for similar state crimes, with a proliferation of new criminal prohibitions, many of which did not require much proof. The kernel of the approach is old; it is famously illustrated by the conviction of Al Capone for federal tax evasion, when Illinois law enforcement authorities were unwilling or unable to nail him for his more serious crimes, which were violations of state law. Nowadays prosecutors often have multiple options for nailing an offender: convinced that Martha Stewart had engaged in insider trading but unable to prove it, prosecutors got her sent to prison for obstruction of justice. The multiple options, combined with heavy sentences, persuade most criminal suspects to plead guilty rather than go to trial. They are rewarded for pleading guilty by being given lighter sentences, while if they go to trial they are very likely to be convicted, and if so they will receive a heavier sentence, especially since in imposing a sentence a judge can consider the defendant’s related criminal conduct, even if not charged—even if charged but the defendant was acquitted of the charge. An innocent person might plead guilty in exchange for a light sentence, rather than run the risk of being convicted and given a much heavier one. The more defendants pleading guilty, the more who could be prosecuted without any augmentation of prosecutorial resources, and in this way the regime of heavy sentences enabled a costless increase in the number of convictions. The Supreme Court seems not to have reckoned with the ability and the desire of Congress and state legislatures to offset, by defining new crimes and increasing the severity of punishments, the Court’s efforts to protect criminal defendants. Even if, by virtue of the procedural rights that the Court has given criminal defendants, fewer innocent people are convicted nowadays, those fewer innocent defendants are on average punished more severely, so that the aggregate suffering of the innocent may be no less than before the Warren Court intervened heavy-handedly in criminal procedure—especially since, as in the case of Mapp and Miranda, the major beneficiaries of procedural rights for criminal defendants are criminals, rather than innocent people falsely charged. Stuntz’s criticisms of the Warren Court will anger civil libertarians, but they are very powerful. Remember, however, that his major criticism is that the Court’s decisions expanding the procedural rights of criminal defendants helped to provoke a political reaction that resulted in a harsher system of criminal punishment, evidenced by the striking growth in the inmate population. Yet he acknowledges that crime was spinning out of control in the 1960s and 1970s. Something had to be done, and was done, and the crime rate flattened at a high level in the 1980s before plunging in the 1990s (and staying down). In 1960 the homicide rate was 4.6 per 100,000 persons; in 1970, 7.9; in 1980, 10.2; in 1990, 9.4—but in 2000, 5.5, and it is about the same today, which is to say, it is almost back to where it was in 1960, before crime became a big issue. The inmate population started its rapid growth in the early 1970s, and, as just noted, by 1980 the increase in the crime rate had ceased and ten years later it began a rapid decline, thus far sustained. Crime rates are higher than they were in the 1950s, but they are tolerable. It is hard not to credit the increase in incarceration with at least some of the decline in crime rates. More criminals are out of circulation longer, and the prospect of long imprisonment deters some people from becoming criminals. Stuntz acknowledges the statistical analysis by the economist Steven D. Levitt, who, after correcting for other factors that have been proposed as explanations for the decline in crime rates, attributed the leveling of those rates and then their drop to an increase in the prison population, along with increases in the number of police, a decline (largely, it seems, independent of law enforcement) in the consumption of crack cocaine, and the legalization of abortion in the early 1970s, which resulted (Levitt argues, though his statistical evidence has been questioned) in a decline in crime rates twenty years later, the theory being that unwanted children are more likely to be neglected, brought up badly, and as a result get into trouble as young adults. Levitt attributes 12 percent of the decline in the reduction of violent crime to increased imprisonment, and 5 to 6 percent to the increased number of police, but Stuntz points out that it costs twice as much (and perhaps more) to reduce crime by 1 percent by increasing the inmate population than by adding police. These estimates are crude, because it is very difficult to separate the effects of the different conjectured influences on crime rates, and it is especially difficult to gauge the likely effect of changes in the criminal justice system—for example, dramatically reducing prison terms while dramatically increasing the number of police. 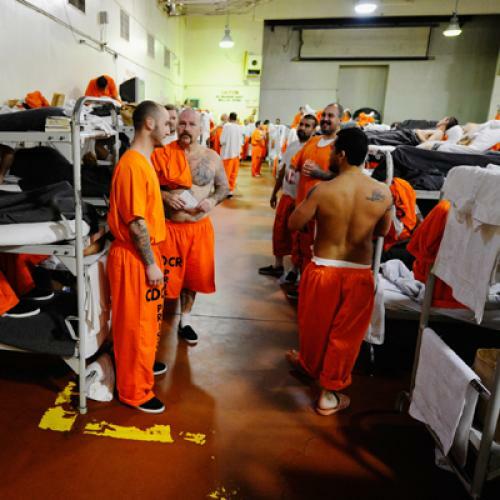 AS I MENTIONED at the outset, budgetary crunches are causing the states to reduce their inmate populations; and a recent Supreme Court decision on overcrowding in California prisons may result in a mass exodus from them. So in time we will be able to consult the results of a natural experiment on the effect of high rates of incarceration on crime rates. Without waiting for the results of such an experiment, Stuntz thought that he knew enough about the real causes of crime to be able to propose better solutions than the current system of high rates of arrests, prosecutions, and convictions, and long prison sentences. Of course the simplest way to reduce the crime rate is to repeal criminal statutes. Noting that only the sale and not the purchase or consumption of alcoholic beverages was punished during Prohibition, Stuntz suggests that we should decriminalize the possession and consumption of illegal drugs. More generally he is hostile to punishing victimless crimes, consistent with the passage in the Declaration of the Rights of Man about confining punishment to injurious acts. But narrowing criminal liability is not his major proposal for reducing the inmate population. As he points out, only a small fraction of most criminal acts are actually punished, because of the gross disproportion between the number of criminal acts and the number of police, prosecutors, and judges; and so he believes that the number of criminal acts punished is relatively unimportant to crime control. Law enforcement used to be more lenient, but crime rates were lower, not higher. Stuntz wants the determination of guilt returned to neighborhood juries, which he thinks temper fear and hatred of criminals with pity for criminals who are themselves neighbors. To reduce what he regards as a particularly excessive number of black inmates (though he acknowledges that since they commit a disproportionate number of crimes, it is not surprising that they are a disproportionate fraction of the inmate population), he wants policing and prosecution also to be at the neighborhood level; he worries that county- or metropolitan-area control of law enforcement results in discrimination against inner-city residents, whose political influence is diluted in these larger jurisdictions. He would like the courts to use the equal protection clause of the Fourteenth Amendment to forbid police, prosecutors, and judges to come down harder on blacks than on whites for similar crimes; and to this end he would like states and cities to be required to keep detailed records of criminal punishments, finely subdivided, by race. He thinks that a more humane and less punitive system of law enforcement would increase the legitimacy of the criminal law and by doing so reduce the crime rate, because more people would internalize a duty to obey the law if they considered the legal system legitimate. He may be right; but in the dubiety of that “may” lies the principal weakness of Stuntz’s book, which is that proposing far-reaching reforms primarily on the basis of supposed lessons of history carries with it the same risk of unintended consequences than he rightly accuses the Warren Court of having taken. The changes that Stuntz proposes are more radical than those engineered by the Warren Court, but the consequences are at least as difficult to foresee. In retrospect, the Warren Court’s effort, in the name of due process, to create a constitutional code of criminal procedure binding on state judges, prosecutors, and police was hubristic. But Stuntz’s preferred reform may be equally hubristic. Allowing criminal defendants to go free because detailed records required to be kept by the local law enforcement authorities do not rebut an inference of discrimination would throw quite a monkey wrench into the machinery of criminal law enforcement, as would inviting courts to invalidate a criminal statute because the judges did not think that the conduct punished by the statute was bad enough to be criminalized. Stuntz is dissatisfied with how the courts have wielded their authority to recast criminal procedure in the name of the Constitution, but he would grant them as much power over the substance of criminal law as the Bill of Rights gave them over its procedures. It is apparent from this important book that the causality of crime and punishment is immensely complex. Intelligent reform will require an understanding of that causality, and such an understanding cannot be obtained without statistical analysis that measures the respective weights of all the conjectured causal factors. No one has done that, though Steven Levitt may have come closest. Intelligent reform will also require careful estimates of the costs of reform. The costs of the changes proposed by Stuntz, which include a major expansion of judicial relative to legislative authority and a return to local juries as the principal determiners of criminal liability, could be immense, and the effect on crime rates can only be conjectured. The rigorous analysis of data is indispensable; and so Stuntz’s provocative conclusions are best understood as hypotheses for social scientists to test. Richard A. Posner is a judge on the U.S. Court of Appeals for the Seventh Circuit and a senior lecturer at the University of Chicago Law School. This article appeared in the November 17, 2011, issue of the magazine.